There I go again, digressing regressing. I like the feel that maybe the shadow is the person and she just has her shoes on backwards. That shadow is as close to an alternate universe I can get. Maybe, in that alternate universe my shadow inhabits, the feet are alternate as well. Or maybe it all just means that I need to get out more. Do we ever make peace with our thighs? ;<) Interesting post Patois! I think many of us would prefer our shadow shape over our actual ones. I adore shadow pictures! I really like the shoes being included. Great shot! Interesting perspective! I really like this one too. 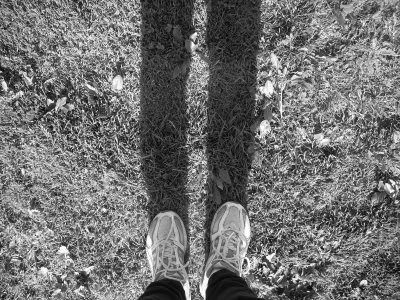 Oh God, if I could tell you the number of times I did that shadow thing with my legs. I hated them growing up, hated them and sometimes would stand looking at my shadow for way too long. Love your thoughts about shadows such as "close to an alternative universe I can get"
The angle of your photo is so cool. I can't even think about middle school without throwing up. Nice photo! Love the B/w.